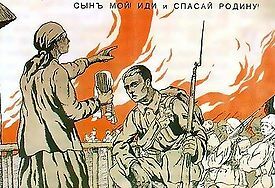 In February the focus of the war remained in the east, as the Bolsheviks struggled to reach an accommodation with Germany and the incredible horror of the Russian Civil War began to pick up steam. 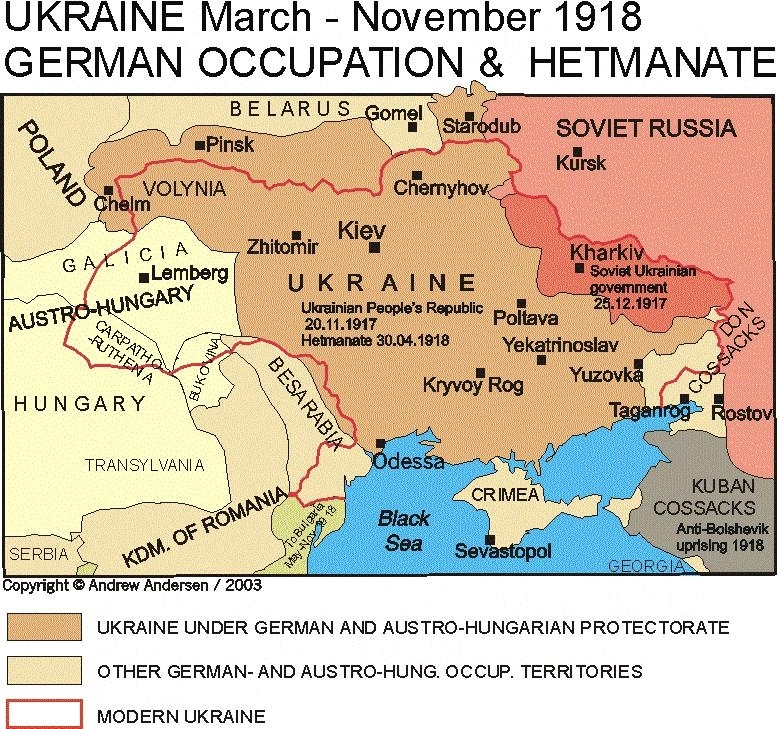 The German demands for Russian territory and an “independent” Ukraine stirred outrage among the Russians, and on 10 February Trotsky declared his government would not sign a peace treaty but would also not resume hostilities. The German response was quick: on the 18th they initiated Operation Faustschlag (the Eleven Day War). 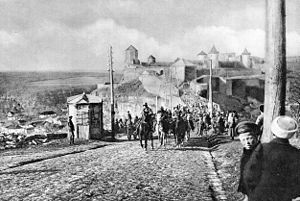 On a line from the Baltic to the Black Sea 53 divisions moved east, heading for St. Petersburg, Smolensk and Kiev. 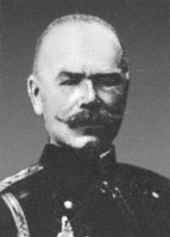 There was little the Bolsheviks could do, especially since on 29 January the supreme commander, Nikolai Krylenko (shot in July 1938), had ordered demobilization of the army, and the German and Austrian forces gained 150 miles in a week. 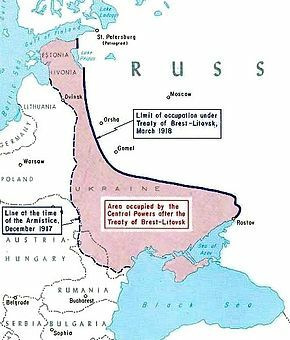 By the beginning of March the Central Powers had captured Minsk and Kiev and were a 100 miles from St. Petersburg, which prompted the Soviet leadership to move the government to Moscow, where it would remain. After prolonged debate and threats by Lenin to resign the Bolshevik Central Committee narrowly voted to accept a peace treaty. 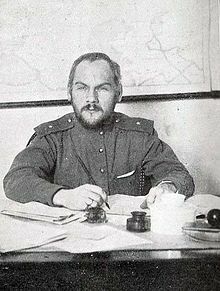 It was clear to Lenin that battling the gathering counterrevolutionary forces was at the moment far more important than the territories that would be lost. Even the Ukraine and its grain supplies would have to take second place to securing Bolshevik power. There was simply no alternative to signing a formal peace, which the Ukraine had already done on 9 February. The storm clouds were already gathering. 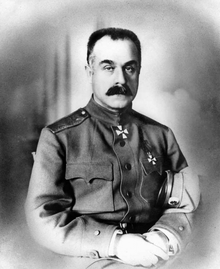 In the south the Cossacks, always a restless group, were organizing under General Alexey Kaledin, who was joined in November 1917 by Lavr Kornilov (of failed coup fame) and Mikhail Alexeyev (who had arrested Kornilov). Together they created the Volunteer Army, filled with former czarist officers and virulently anti-Bolshevik; it would form the core of one of the major White armies. On 28 January they proclaimed the Kuban People’s Republic, which declared its independence on 16 February. In other news, General Allenby decided in late January that he needed to secure his right flank in Palestine by occupying the Jordan Valley and began preparations in February. 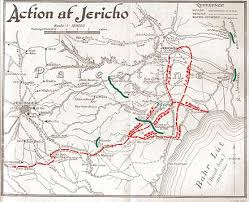 After a three day battle Jericho was taken on 21 February with minimal casualties, and by the 25th Turkish forces had withdrawn to the east bank of the Jordan River. 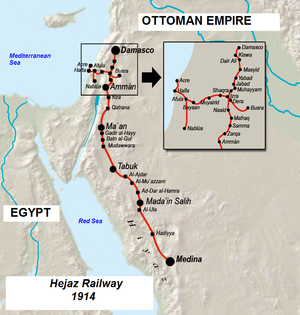 But the Hejaz railway was still functioning, providing a supply line for Turkish units further south. 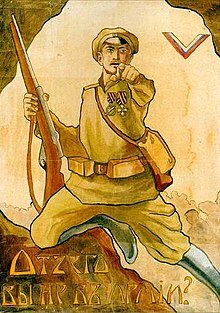 Far to the north the Turks benefited from the Bolshevik Revolution when the Russians evacuated northeastern Anatolia; on 25 February they retook Trebizond, lost to the Russians in April 1916. And on 5 February the British government repeated its promises to the King of the Hejaz regarding the independence of the Arabs, which pledges had already been dramatically undermined by the secret Sykes-Picot Agreement of early 1916. That the Bolsheviks had already published the text of the Agreement seemed not to bother London. 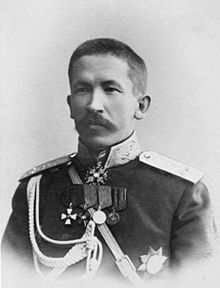 This entry was posted in Alexey Kaledin, Bolsheviks, Brest-Litovsk, Britain, Cossacks, Edmund Allenby, Germany, Great War, Hejaz, history, Jordan Valley, Kuban, Leon Trotsky, Lvar Kornilov, Mikhail Alexeyev, Moscow, Ottoman Empire, Palestine, Russia, St. Petersburg, Sykes-Picot, Trebizond, Turkey, Ukraine, Vladimir Lenin, Volunteer Army, war, World War I. Thanks again for re-living this horrible war for us. You’ve done us a tremendous service, but I can’twait for this monstrous war to end. Ten more months!